In follow up to the press release I blogged about last month, we now have the data which has rocked the foundation of the diabetes world: the diabetes medication empagliflozin has been found to reduce the risk of cardiovascular deaths and all cause mortality in patients with type 2 diabetes and cardiovascular disease. 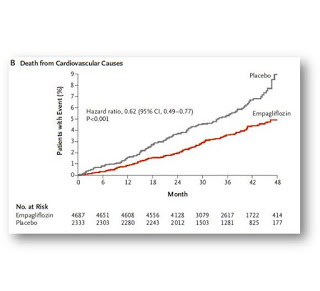 The EMPA-REG study, published by Canadian Dr Bernie Zinman and colleagues in the New England Journal of Medicine, randomized 7020 people with type 2 diabetes and established cardiovascular disease to receive either empagliflozin 10mg, empagliflozin 25mg, or placebo, in addition to their usual care. After a median of 3.1 years, they found that there was a significantly lower risk of death from cardiovascular causes (3.7% on empagliflozin vs 5.9% in the placebo group), a reduced risk of death from any cause (5.7% on empagliflozin vs 8.3% on placebo), and a reduction in hospitalization for heart failure (2.7% on empagliflozin vs 4.1% on placebo). 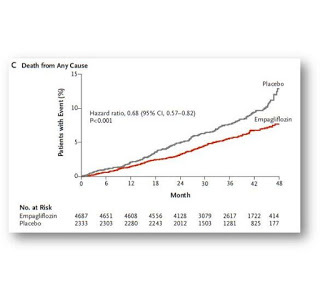 Put another way: empagliflozin decreased the risk of hospitalization for heart failure by 35%, reduces the risk of death from cardiovascular causes by 38%, and reduced the risk of death from any cause by 32%. These results are truly landmark, in that we have never before definitively proven that any diabetes medication clearly reduces the risk of cardiovascular disease or death. There are two other medications in this class of diabetes medications (called SGLT2 inhibitors) which are available in Canada (canagliflozin (Invokana) and dapagliflozin (Forxiga)). These medications have similar studies underway, but results are still a couple of years away. 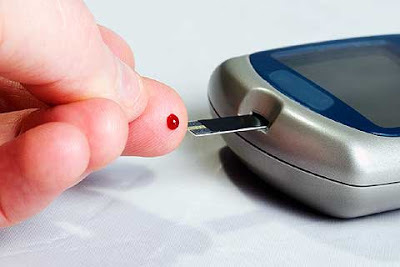 The EMPA-REG results have caused diabetologists around the world to have to reconsider current practice guidelines for type 2 diabetes, and whether this class of medications should take priority in the selection of treatment for our patients. While it is always of paramount importance to consider benefits and risks of any medication, this data certainly suggests that the SGLT2 inhibitors should be considered high on our list of choices for treatment of type 2 diabetes.Disclaimer: I receive honoraria as a continuing medical education speaker and consultant from the makers of empagliflozin (Boehringer-Ingelheim and Eli Lilly), canagliflozin (Janssen), and dapagliflozin (Astra Zeneca). 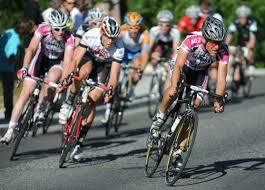 I am involved in research of SGLT2 inhibitors as a treatment of diabetes. 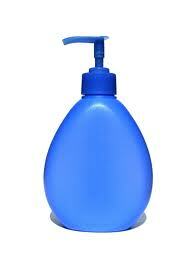 Could Soap Increase Our Risk of Diabetes?